WD VelociRaptor drives offer an unmatched combination of high performance and high reliability, perfect for workstations, high-end video and photo editing, low-end servers and performance enthusiast's systems. Comes with a 3.5-inch mounting frame for easy installation into today's high-performance systems and chassis. 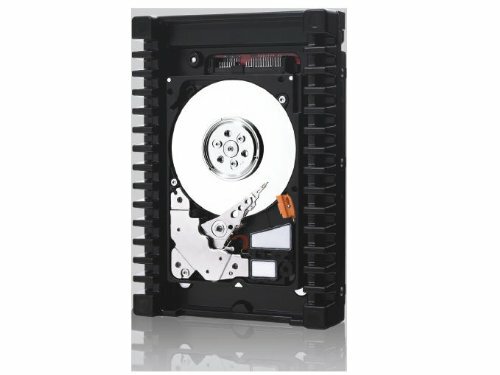 Ultra fast - Designed around a 10,000 RPM spin speed, these SATA 6 Gb/s drives include a 64 MB cache and deliver the ultimate performance for photo and video editing. Rock-solid reliability - With 1.4 million hours MTBF, these drives have the highest available reliability rating on a high capacity SATA drive. High capacity - State-of-the-art technology delivers a balance of high performance and high capacity perfect for data-intensive workloads that require large amounts of storage such as video editing, 3D rendering and scientific modeling. Ultra-cool operation – Consumes less idle power and uses similar active power as the previous generation WD VelociRaptor, while offering higher capacity and performance. Advanced Format (AF) – Technology adopted by WD and other drive manufacturers as one of multiple ways to continue growing hard drive capacities. AF is a more efficient media format that enables increased areal densities. IcePack mounting frame - The 2.5-inch hard drive is enclosed in a backplane-ready 3.5-inch mounting frame with a built-in heat sink that keeps this powerful little drive extra cool when installed in high-performance desktop chassis. NoTouch ramp load technology – The recording head never touches the disk media ensuring significantly less wear to the recording head and media as well as better drive protection in transit. Pre-emptive Wear Leveling (PWL) – Ensures reliability for applications that perform a high incidence of read/write operations at the same physical location on the disk. Rotary Acceleration Feed Forward (RAFF) – Optimizes operation and performance when the drives are used in vibration-prone, multi-drive chassis. Environmentally Conscious – In addition to being RoHS compliant, this generation of WD VelociRaptor also provides a halogen-free design.